"Great place to stay without the resort price." Have a question for Seralago Hotel and Suites Main Gate East? "We love it there and staff is always helpful and nice." "The hotel and its facilities are overall good." 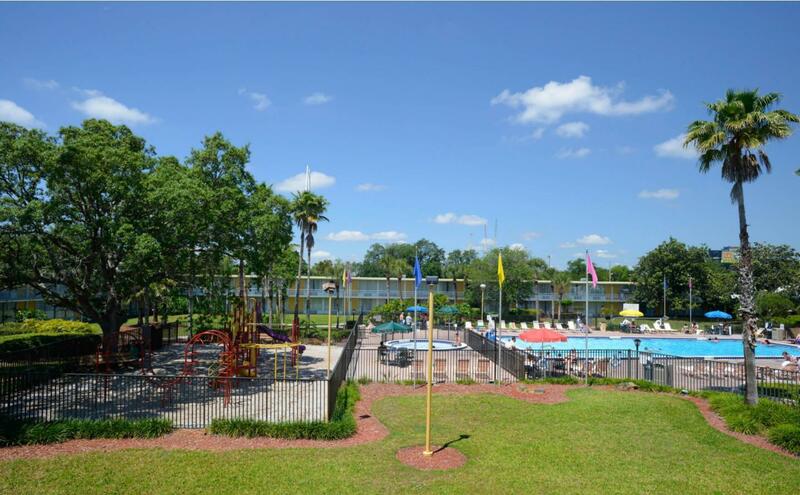 Right near Old Town and within a manageable distance to Disney's main gate and MGM Studios, Seralago Hotel and Suites Main Gate East offers superb rates and a great atmosphere. If you've brought the kids along, have a stroll over to the hotel's kid's corner where the children can eat tasty finger foods and watch cartoons and Disney epics on the big screen TV. And for the adults, the Sports Court Street Bar offers fantastic cocktails and a fine beer selection. 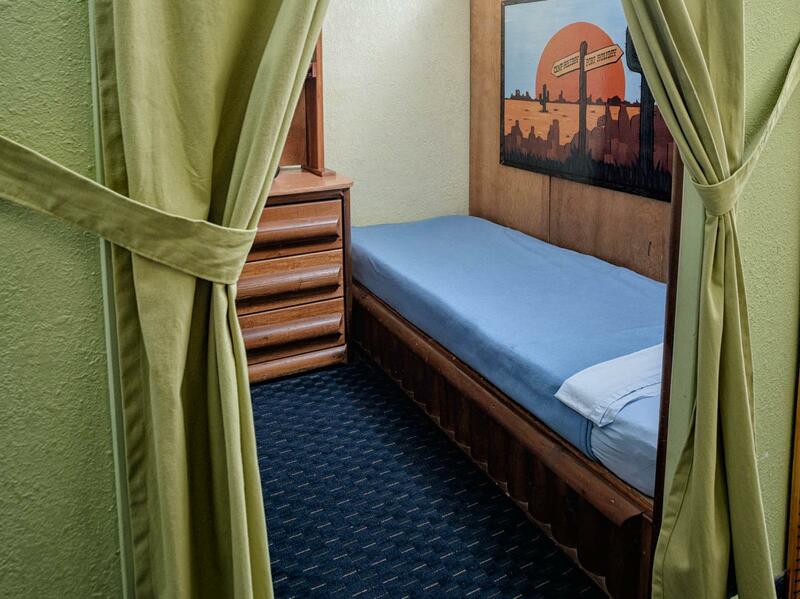 The hotel features a delightful little dungeon-themed game room, two heated pools, and a heated Jacuzzi - not bad for the price you're paying! 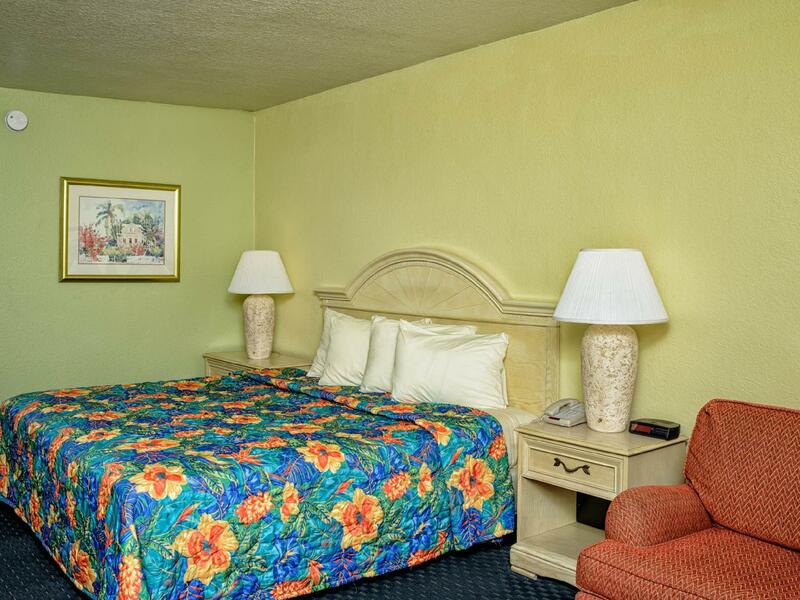 Enjoy the spacious guestrooms and explore the area on foot. Check out the 'Kids eat free' feature for extra savings! "Convenient location to reach the parks." I had 2 rooms a Family Suite and Double Room Suite - The entry door to the Double Room Suite had to be slammed to close and at times would not lock and could be pushed open when trying to exit the room. Complained 7 times and was told that maintenance would come after the first 2 ( I repeatedly stated the room number) when I complained no one had shown up they stated Oh we thought you were in the family suite (although no one from maintenance showed up to the that room either as my son and his family were in that room). After constantly complaining about the issue for 2 days I gave up. The room was not cleaned appropriately dirty tissues under sofa, garbage left on the floors, counters and bathroom were not cleaned. We were not provided soap or shampoo after day 2 and we stayed 5 nights. The bathroom had no ventilation and as a result had black mold growing near the ceiling. Not enough towels and only 1 washcloth provided. The sofa bed was like a bed of nails. NEVER AGAIN! Upon my arrival as I entered the check in office. I stood in line and there where two arguements less than 3 minutes apart with the staff and customers. I booked for a large king bed and got a double bed. My room was not a smoking room but smelled like one soon as I entered the room. The walls looked very damage, the shower did not look to pleasant, I saw a strand of hair on the floor. Not to mention when I took a towel to dry off there was a long piece of hair on it. I felt disgusted. I didn’t even want my bare feet to touch the floor after seeing that. I must say you get what you pay for. NEVER EVER AGAIN. Had 2 suites Family and Two Room Our 2 room suite entry door had to slam repeatedly to get it to shut at times wouldn't lock when leaving and could be pushed open Complained and stated the room number 5 times was told maintenance would come and no one ever showed up Complained again and was told that thought it was room 418 even though I told them 5 times 704 No one showed up to either room Gave up and just endured the crappy door Housekeeping was poor noticed dirty tissues under the couch and bathroom still dirty especially bathtub Counters not cleaned and not enough towels or washcloths provided Soap and shampoo was not left after day 2 Sofa bed was like sleeping on a board Black mold in the bathroom as there was no ventilation fan Needless to say my disappointment goes beyond words to describe one of the worst hotel stays EVER!! 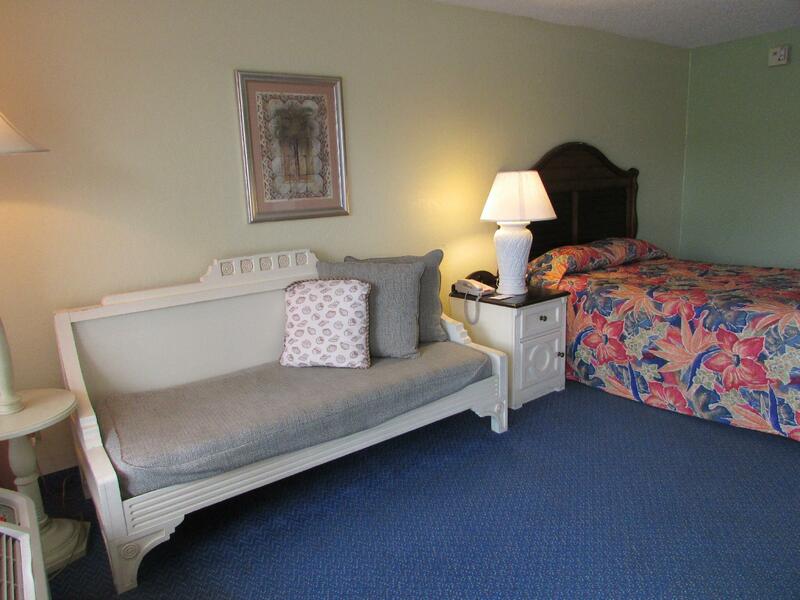 Room was well loved, but very clean... Could have used more lighting however... Had complimarty bus ride to parks... Very nice staff..
You would expect more due to the hotel being by Disney.... Wrong! The room carpet was old and dirty, the tub wouldn't drain and housekeeping didn't even report the issue. The bed comforter and sheets wasn't the cleanest and the pillow had stains on it. Definitely wouldn't recommend this hotel to anyone. Staff texted daily to check on us. Two pools, 2 hot tubs, laundry, magic shows on monday nights. Great food. Great staff. Great rooms. 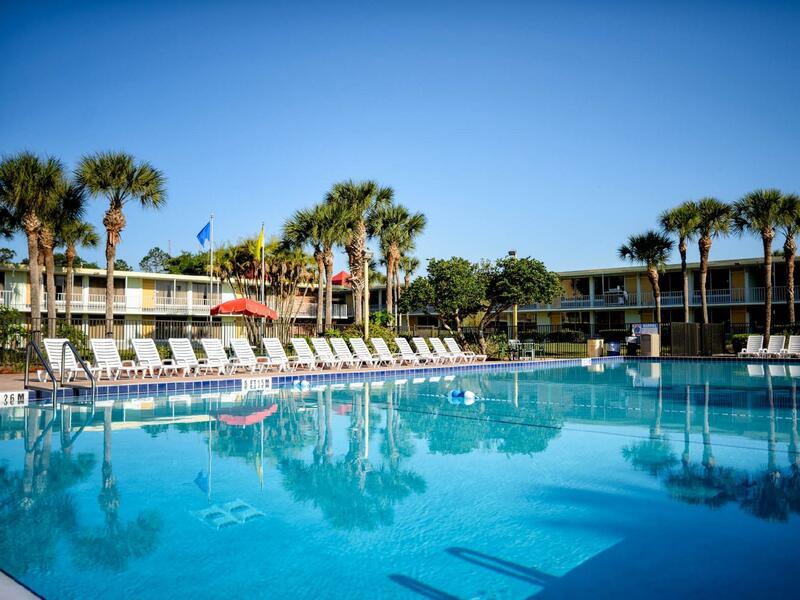 Walking distance to Old Town (great place to visit), diners, stores and more. Very clean rooms, housekeeping very thorough. Great place to stay for the value. We did not take advantage of many of the onsite features of which there are many as our time was a just an overnight stay to be able to give an informed opinion. But if you are going to be visiting area attractions and want an inexpensive place to stay, this is a good deal. The room we stayed in, although a bit dated, was spacious and clean. Clean Sheets, No Bed Bugs. Clean Towels, House Keeping The Best. I always Choose this HOTEL. Jacuzzi is nice and Pools are Clean. The HOTEL IS UNDERSTANDING. Do not BELIEVE WHAT PPL SAID ABOUT THE HOTEL. I GIVE IT A 10 STAR!!! The room smelled like smoke. It's not the staff's fault when people smoke but it was so strong that my family even smelled it. It was full and another room was not an option. I would have enjoyed sleeping in a room that didn't have a strong smell. I will stay again but already requested to make sure the room don't smell like smoke. Worth it for the price you pay. If you're not looking for luxury, you'll have good customer service (they send txt message checking how is going) and in a good localization. The positive point is that they try to fix right away what is not being well. For whom doesn't want to pay so much in the hotel and more to enjoy the city, I would recommend trying this one. Mattress was terrible, blood on side of sheet, no mini fridge. 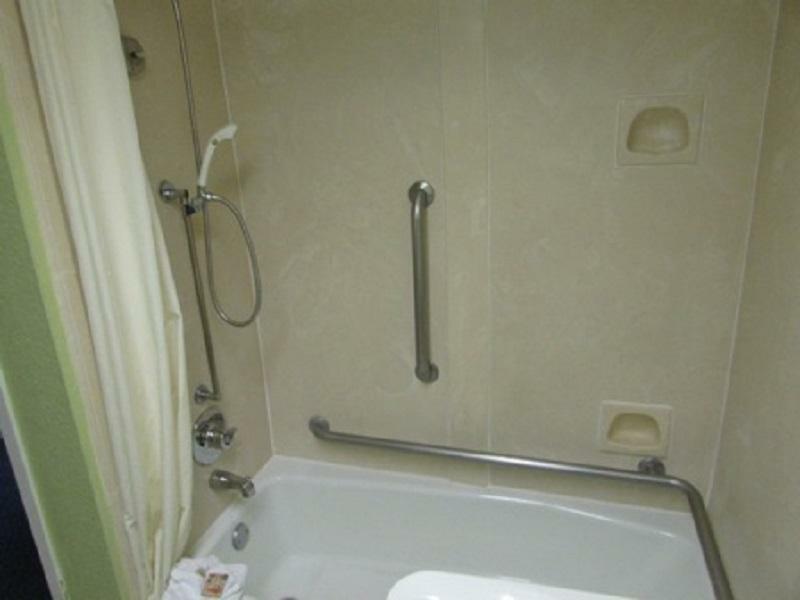 Asked for handicap room and even though there was handicap toilet and sink, there was no walk-in/roll-in shower,it had a tub. But service was great with anything we asked to be delivered to room. Room smaller than expected, but nonetheless a great value. Staff eager to please. Would stay again. I think the motel was ok, especially taking into consideration low price. Still, room was quite dated, but at least bathroom looked recently renovated. The room even had iron with iron board. $7.95 for so called resort fee was a bit annoying, but overall - not bad experience at seralago! So this was actually a good investment in my opinion, I stayed for a week, definitely got my money's worth. The staff was nice, willing to help but not overbearing. (Which is nice for me because this was my first solo-hotel experience.) The rooms were quite large, (admittedly I got a deluxe king, but paid around $30ish per night) - came with a desk, a rolling table - which was great when I was watching tv - sharing dinner with the person I came to visit. The double fridges were the best part, because I was able to buy a few two liters from the walmart nearby, and save myself a decent amount of money. Good for budget. They supplied a good amount of towels, and restocked the soaps/extras every time they cleaned the room. This place doesn't have vending machines, so if you're a late-nighter this is something to keep in mind. Not much of a let down or anything, but something to note. They're an older hotel, a little further out, but if you don't mind the drive - save your money here.